Desert Safari is the best way to discover the Thar Desert on a camel’s back. It allows tourists to experience the rustic essence of the only major desert in India and introduces them to the exuberant lifestyle of Rajasthan. In addition to sitting on camel’s back and enjoying safari, the special tour will also take tourists on to a rich sightseeing of India’s heritage forts, palaces and monuments of excellent cadre. Enjoy the breakfast followed by a tour of Delhi. 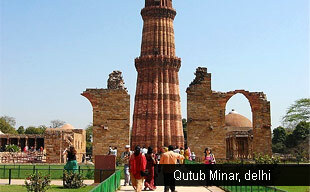 Delhi city tour includes a visit to heritage attractions of Delhi including Red Fort, Jama Masjid, Humayun's Tomb and Qutab Minar. Next exclusive experience here is the drive past through President’s house and Parliament of India. The evening is free at leisure. Overnight stay at the hotel. Drive to Agra after breakfast. Enroute visit Sikandra, to witness the self commissioned tomb of Akbar. This is another way to experience the richness of Mughal architecture in India. After sightseeing, continue towards Agra. On arrival, transfer to hotel. In the afternoon, proceed on a visit to Agra Fort. This is a world heritage site renowned to serve as a seat of Indian Empire under Mughal dynasty rule. From here, one can overlook the splendid beauty of Taj Mahal. Return to hotel for dinner and overnight stay. Early morning wake and prepare for visiting the Taj Mahal, one of the most famous monuments in India. 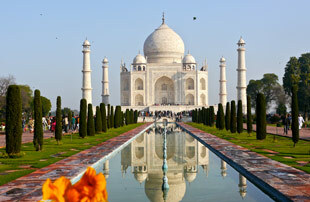 It was built by Shah Jahan as a tribute to his wife and favourite queen, Mumtaz Mahal. Witness the brilliance of Taj Mahal in the early morning. Return to the hotel for breakfast. Check out Agra for a drive to Jaipur. Upon reaching this pink city, check in the hotel for overnight stay. Jaipur is the capital of Rajasthan and the entry point to our Desert Safari. Replete with royal charm and elegance, the city boasts prime cadre of forts, palaces, monuments, etc. After breakfast, begin the Jaipur City tour with an excursion to Amber Fort, the world heritage site in Jaipur. In the noon, stop over at the Hawa Mahal landmark for a photo session. After lunch continue towards City Palace and visit the prominent Museum here as a part of sightseeing. Also visit the world heritage site of Jantar Mantar observatory as a part of Jaipur sightseeing. Return to the hotel for overnight stay. After breakfast, check out Jaipur for a drive to Jodhpur, the blue city. It is here that the guests will get to experience the real meaning of desert safari. 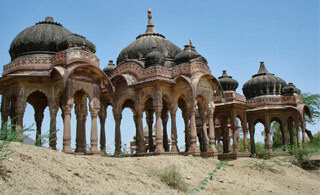 Picturing the arid topography, this city is also close to the scintillating deserts of Rajasthan. As a result, it holds rich opportunity of camel safari as well. Upon arrival here, check in the hotel for overnight stay. Also visit the Mehrangarh Fort here and soak in the blue hues that made Jodhpur famous worldwide. Return to the hotel for overnight stay. After breakfast in Jodhpur, get the most awaited experience of desert safari with an excursion to Manwar. Located in the arid wilderness, the desert camp is a heritage location where it is believed that the Mughal Emperor Jehangir, known for his luxurious lifestyle, used to set up royal style camps while on conquests. The location is now used to give authentic experiences to the tourists coming here for Camel Safari. Drive and return to the hotel for overnight in Jodhpur. In time transfer to Jodhpur Domestic Airport to board a flight to Delhi. Tour ends.